Situated minutes from the heart of Washinton Valley, quiant, comfortable 3 bed two level condo with all the amenities of home. Minutes from all the valley has to offer. Storyland, skiing, hiking, shopping, dining, and so much more. Go into the valley and enjoy the day, then come home to peace and quiet of this 3 bedroom condo situated on 50 acres of conservation land to enjoy peace and quiet. Enjoy all the amenities of home, from a full kitchen to washer/dryer and much more. All you need to do is pack your bags! Take advantage and ask about specials as we try to make your vacation as financially comfortable as possible, so that you can relax and enjoy the many attractions the valley has to offer. The condo offers,full kitchen, dining area, half bath and living room on the first level. Second level has three bedrooms and full size bath. The first bedroom has a balcony and a queen size bed, the second bedroom a full size bed, and the third a set of twin beds. If additional room is needed there is a self inflating queen blow up mattress which can be used in the living room near the electric child friendly fireplace. For years, I visited the Valley with my family to ski. It was tough with the hotel fees, feeding the family and just trying to be comfortable without having restraints to do all the activities I loved to do. I decided to buy this unit and offer it at family friendly rates so that the cost of a vacation wouldn't be a financial strain and take from the enjoyment of the vacation. Being a social worker, it gives me pleasure to offer my home to families so that they can truly afford and enjoy a great vacation. I strive to keep the condo clean, cozy and comfy. This way it feels just like home........a comfy home! I chose this property because of the location. 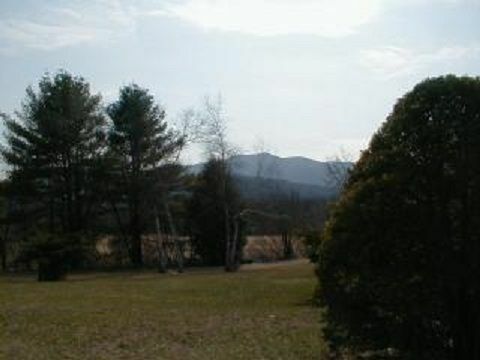 It is situated on the North Conway line, and offers a great back road for traveling throughout the Valley. It is close to all amenities yet situated on 50 acres of conservation land near the scenic overlook to allow you the peace and quiet needed after a long day. I love to walk out the back door and able to walk down the trail and inhale the peace and quiet. I fell in love with this home due to the location. I am located right next door to the scenic overlook, therefore those views are my views. The condo has a certain old fashioned New Hampshire feeling which I keep for the true feeling of New Hampshire. Overall, I love the area, the condo, and the true feeling of New Hampshire and relaxation you get right when you walk in the door! the minute you walk thru the door. queen size bed and a fantastic balcony to enjoy the mountain views. disposal, central vac, cable, etc. Please note unit has basic cable, for longer rentals full cable can be offered for difference for rate by renter. Heritage House and Cathedral Ledge are just a few. Rates are based on occupancy of 5 guests. Additional charges may apply for larger groups.Sundays have a check out of 9 am if someone else is coming in after you. Unfortunately, due to allergies I can not take pets. I hope you understand.